KEEP YOUR BABY COOL AND COMFY - This Stroller Fan is perfect for keeping your little one from overheating in the stroller or playpen on hot and humid days. The Dreambaby Stroller Fan can also be used by adults. It can be clipped onto a beach chair for a sunny day by the shore or a treadmill during intense workouts. SAFETY COMES FIRST - Don't worry about your inquisitive toddler. The Dreambaby Stroller Fan features baby-safe foam fins, eliminating the risk of any harm to a rogue finger or two. FLEXIBLE NECK AND STURDY CLIP - Whether it's a car seat, a stroller on the move, or a crib at home, the Dreambaby Stroller Fan employs a flexible neck and stout clip, allowing the fan to keep your child cool no matter the surface or angle. A SOURCE OF ENTERTAINMENT - The bright colors and moving blades will entertain your child while keeping them cool in their stroller. 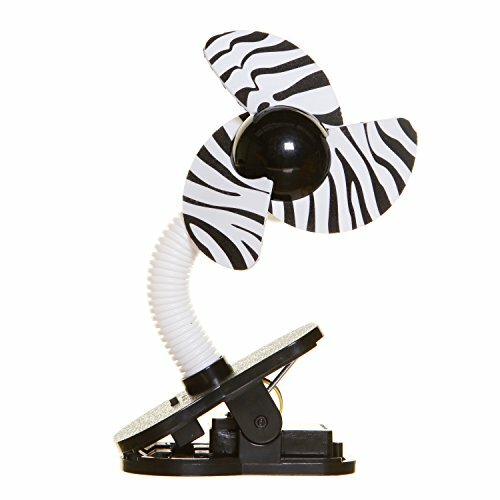 BREEZE ON THE GO - Take this Dreambaby Stroller Fan to the beach, pool, picnic or park! It is lightweight, portable and easily fits in your bag of essentials. Simply insert 2 AA batteries, and set the fan up alongside your infant to watch them cozily and comfortably nap away long summer days.